Looking at the sheer number of Health & Fitness apps in the German app stores, one might come to the conclusion: Market saturated, revenues shared between the big players, no business case for another “Me-too” app. Well, we recently analysed the Top 50 Health & Fitness apps by revenue in the German market and we’d like to prove you wrong. 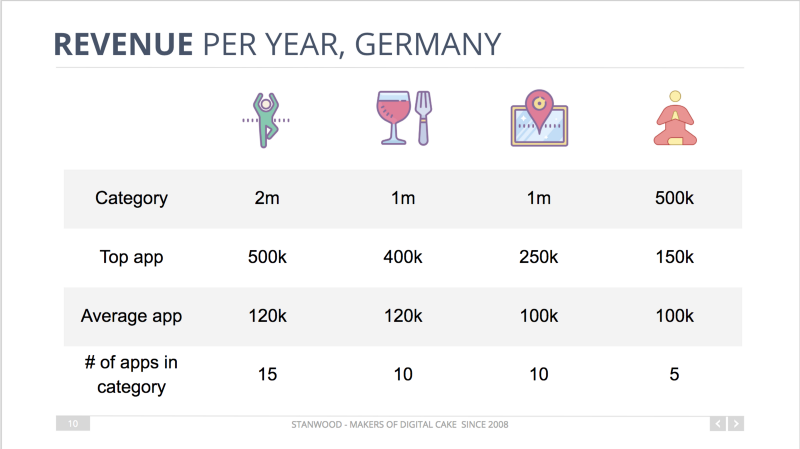 stanwood is a Berlin-based international app development agency with 10 years experience in the Health & Fitness market. Stanwood built successful fitness apps like Sophia Thiel, Mach dich krass by Daniel Aminati, XTREME KRASS and Shape Republic for ProSiebenSat.1 subsidiary 7NXT Health, and is currently working on two new Health & Fitness apps for a German publishing house and a well-known German athlete. Today, I’m going to share our key findings on what makes Health & Fitness apps successful. Monetization: Which monetization model performs best? Paywall: How does the right paywall position increase your conversion rate! Pricing: Where is the sweet spot between subscription price and number of subscribers that maximizes your revenues? Trial periods: Do free trial periods have any proven effect on your conversion rate? But first, let’s have a quick market overview to understand the full potential of the German Health & Fitness app market. Yes, there are already a number of successful players in the German Health & Fitness app market. BUT: The market is big enough and still growing, so there is enough room for new players to secure a piece of the revenue cake. 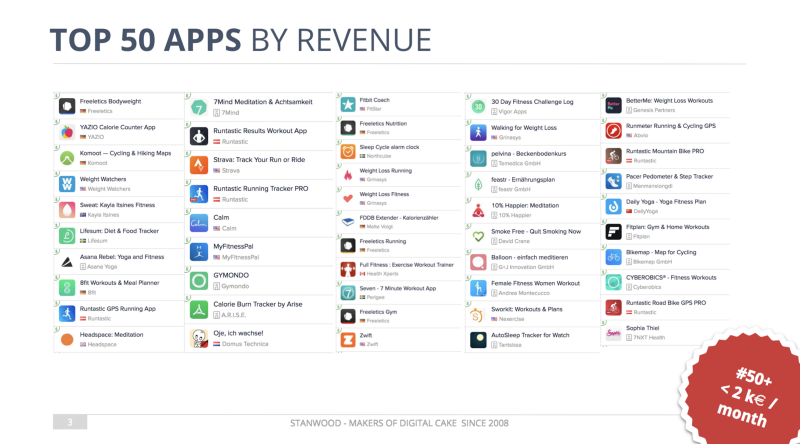 Let’s have a closer look at the Top 50 Health & Fitness Apps by revenue in Germany. 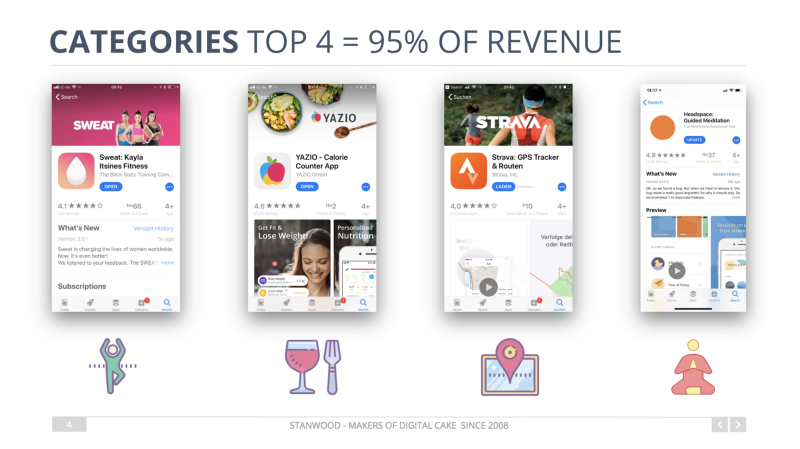 We identified four main subcategories that make for 95% of its total revenue and cater to slightly different user needs. 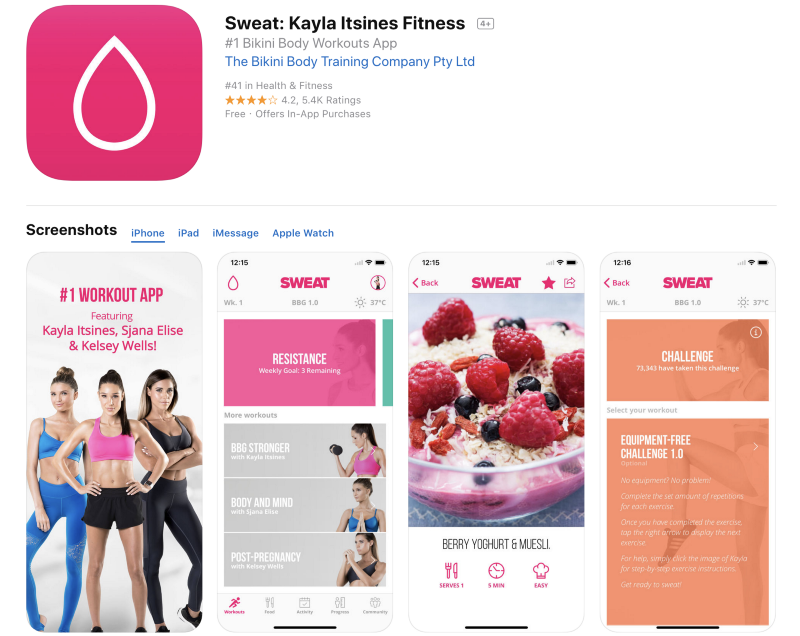 The #1 app by revenue in this category is Sweat: Kayla Itsines Fitness. It offers short video workouts, customisable meal plans, global fitness challenges and special programs designed for weights, yoga and post-pregnancy. The app is free with In-App subscriptions of 1 month, 3 months or 12 months. 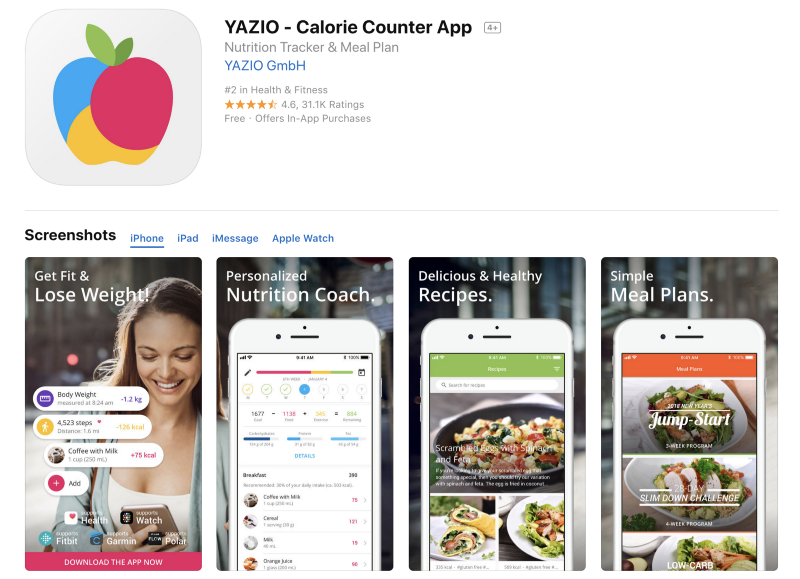 The #1 app by revenue among calorie trackers is YAZIO. Users can manage their daily food diary, track their activities and create a personal plan to lose weight or build muscles. YAZIO is free with subscription options of 3 and 12 months. 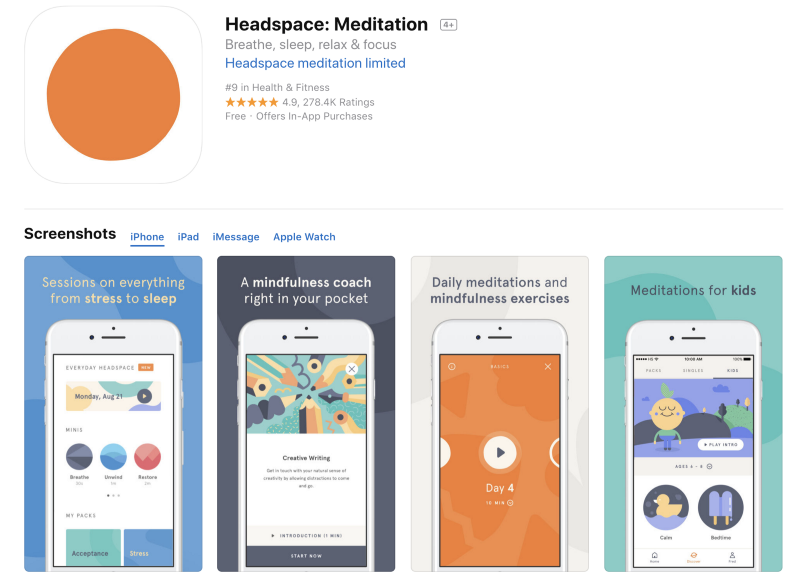 Headspace: Meditation is the #1 meditation coach app by revenue. It offers audio-guided meditations and mindfulness techniques, animations with tips and other wisdom to keep users on track. The basic version is free with auto-renewing subscription options for 1 or 12 months. 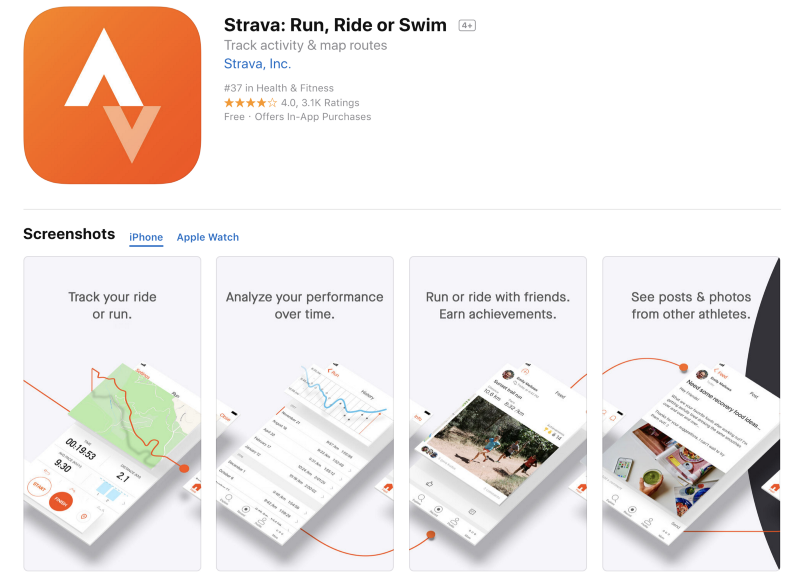 STRAVA: Run, Ride or Swim is the #1 app for tracking sports activities and sharing them with the community. Users can record and analyse their training, create maps with their personal routes, compete with other users and share their achievements in their social networks. STRAVA is free with subscription options of 1 or 12 months. 1. Which monetization model performs best? There are various ways for Health & Fitness apps to generate revenue, among them single payment options, subscription models and advertising. We found that 90% of all German Top 50 Health & Fitness app revenues come from subscriptions. 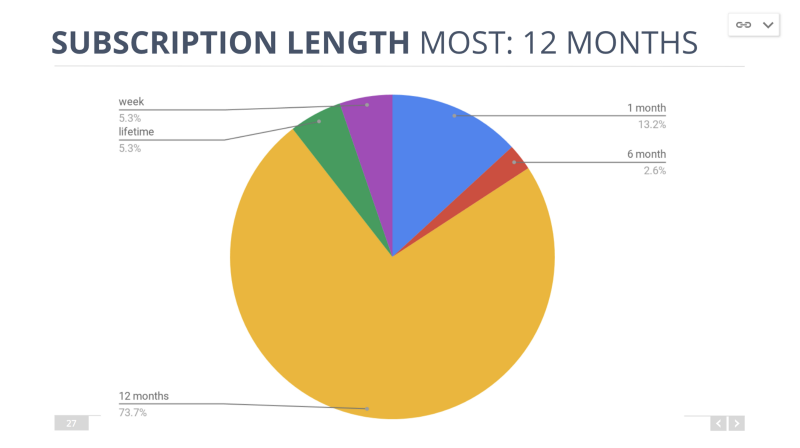 Looking at the preferred subscription period, 74% of all users choose a 12-month subscription. 2. Where Do You Put Your Paywall To Increase Your Conversion Rate? 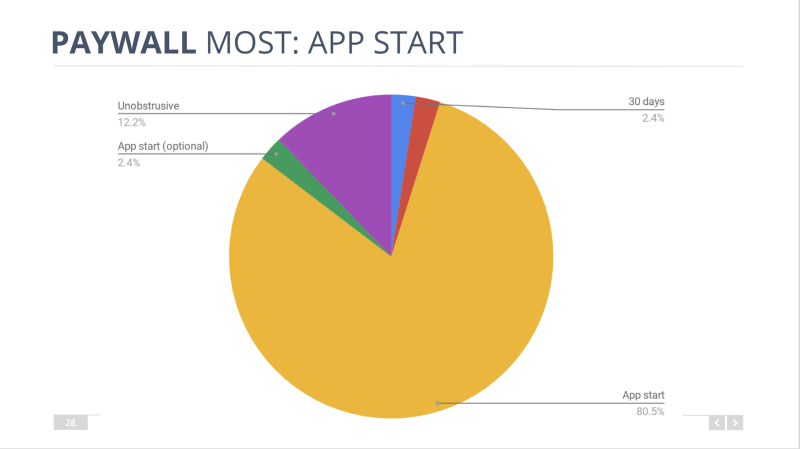 We analysed the onboarding process of all Top 50 German Health & Fitness apps and found a correlation between the position of the paywall and the app’s rank in the app store. Most Top 50 apps show a hard paywall right with the app start. Our conclusion: The earlier users are confronted with the paywall, the higher your conversion rate will be. 3. Where is the Sweet Spot Between Subscription Price and Number of Subscribers? The math is simple: The higher your subscription price, the fewer subscriptions you’ll get. In our own apps — and we developed 60 iOS and Android apps in the last three years alone — we experimented a lot with pricing models. We found that the sweet spot between price and number of subscribers in Health & Fitness apps lies somewhere between 20 and 70 EUR per year. 4. Trial Periods Do Not Increase Conversion Rates! Some of you might feel that you need to give your users a free trial period to get them hooked, before they convert into paying subscribers. Looking at the Top 50 German Health & Fitness apps, we found that 80% of these apps do not offer free trial periods. The simple truth is: Most of those apps offer a free basic version anyway, so users can experience the main benefits before they subscribe. So, it seems that free trials do not have any impact on your conversion rate. 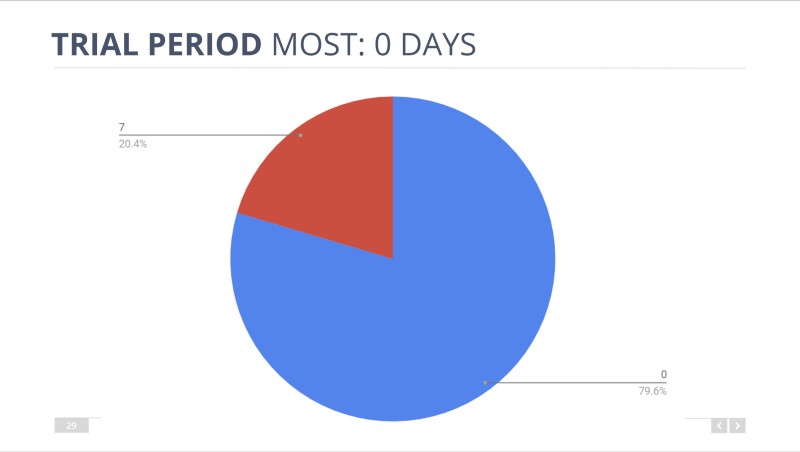 Offer a 12-month subscription for your app, as 73% of all converting users choose that timespan for their subscription period. Build your onboarding process as lean as possible: The less screens between app start and paywall, the higher your conversion rate, the higher your revenues, the higher your app store rank. Set the right price! 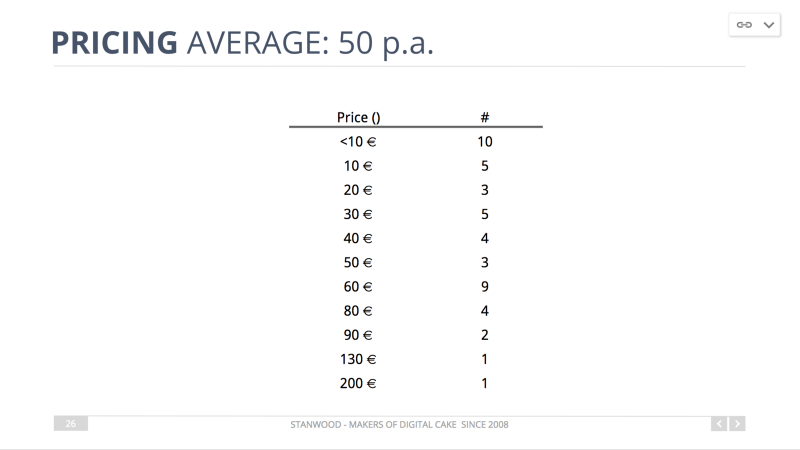 The sweet spot to maximise your revenues on a long-term basis lies somewhere between 20 and 70 EUR. So choose your 12-month subscription price somewhere in that range . Trial periods have no proven impact to increase conversion rates.